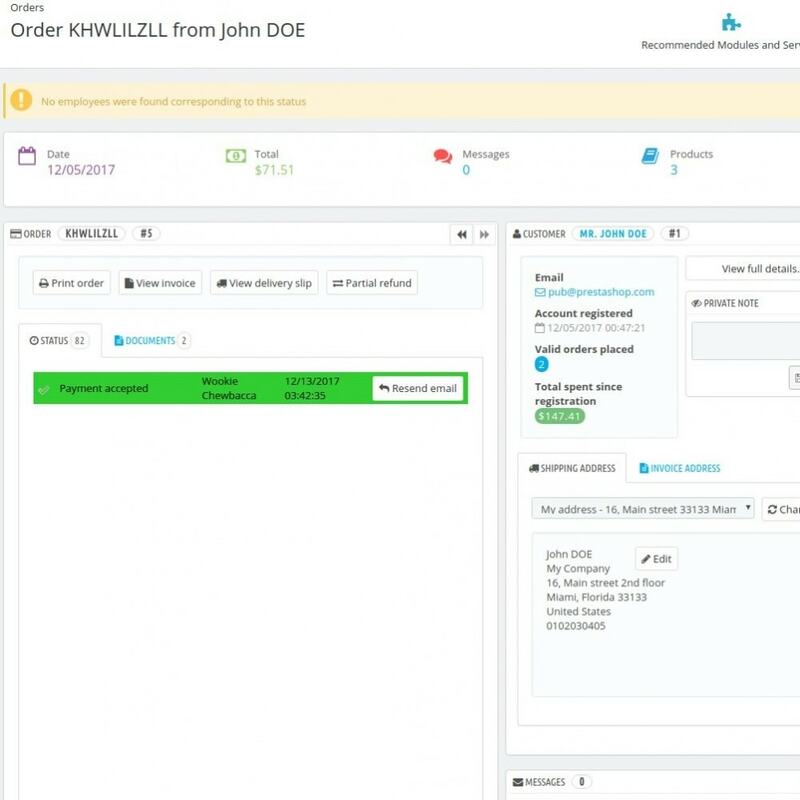 This module allows a shop administrator to set a specific employee, or several specific employees, to be notified of order status changes. 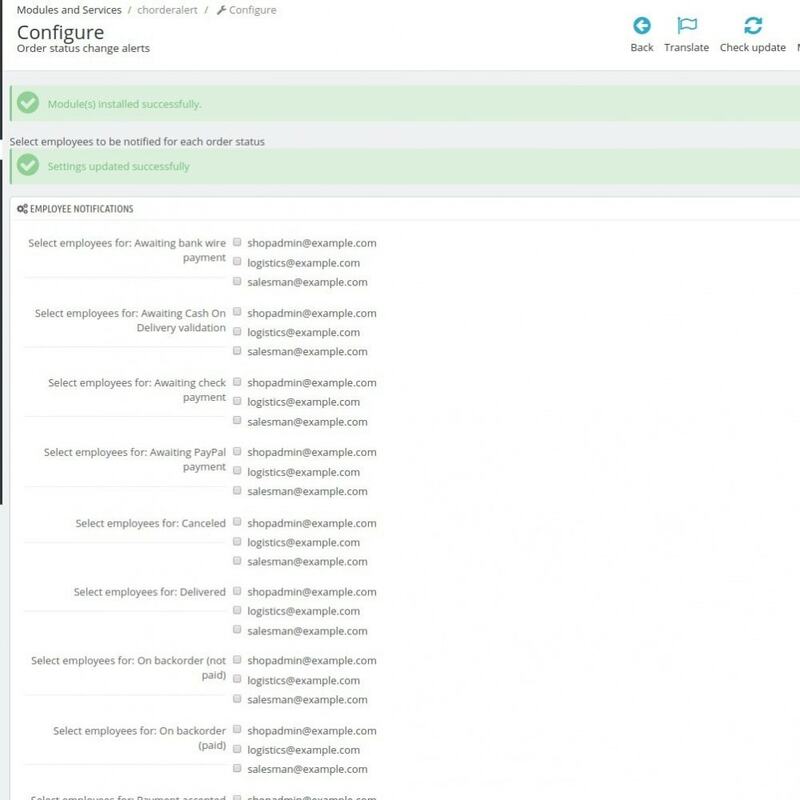 Separate / different employees can be set to be notified for every order status change. In larger or team-based company setups, where different people take care of different things, this module is a must ! 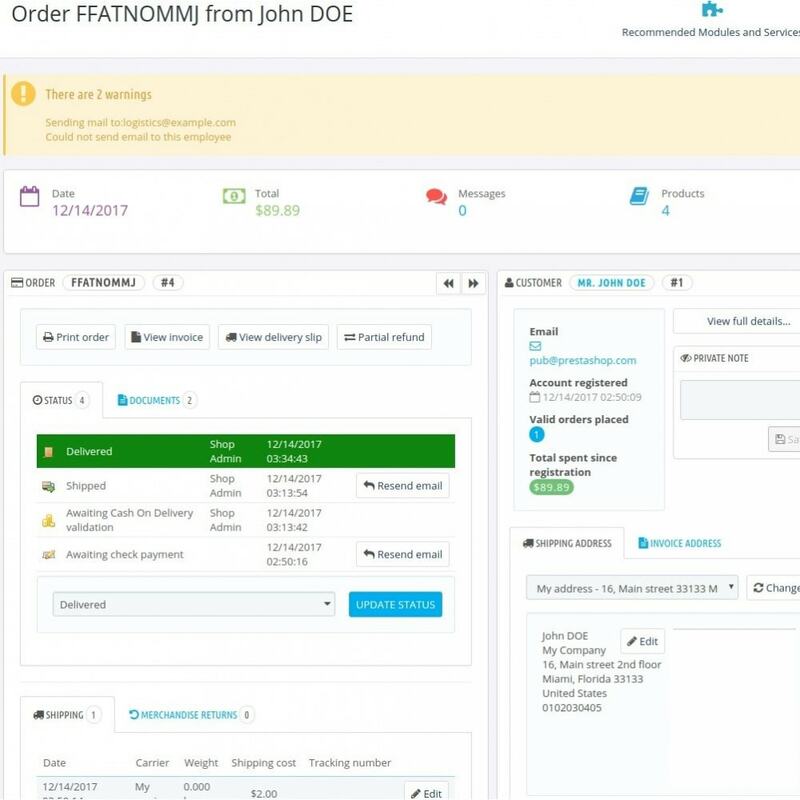 It allows the sending of a notification to a team member when the payment has been rejected for a product, and the customer needs to be contacted for clarifications, and another team member, if the product can be shipped, and is set to delivered. It allows the separation and better management of order handling tasks, and for better customer relationship management, allocating the same people for the same tasks, when an order's status changes. It allows for better management of the company's human resources, allocating the right people to the right tasks, when an order's status changes. And it is especially important and a must-have for companies that do the payment processing in one building or office, and the actual packaging and shipping of goods from another building, which is how the great majority of small-to-mid-sized and even large companies operate. Simple, easy installation of configuration. 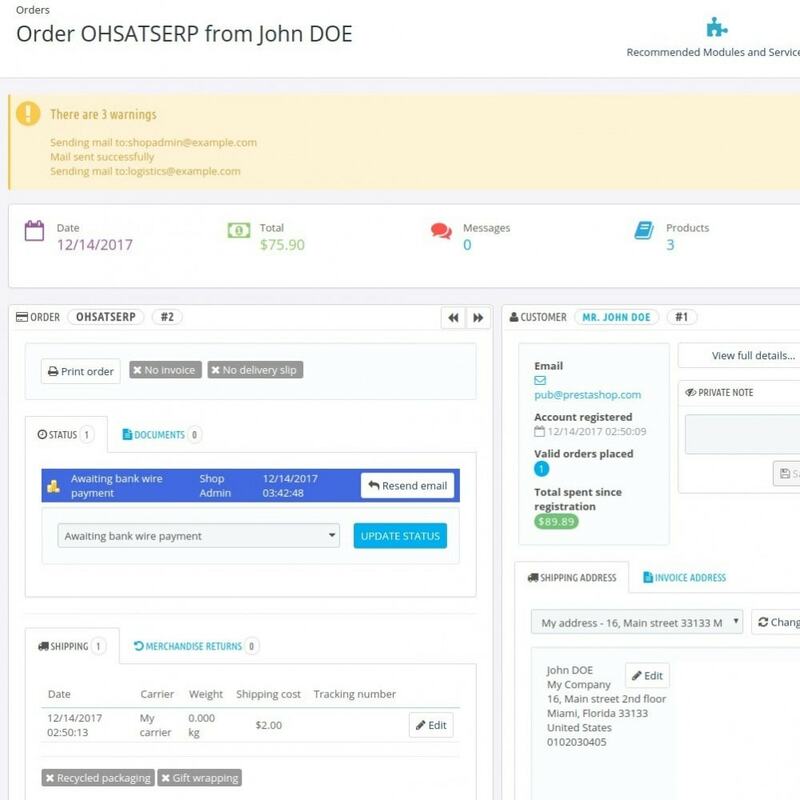 Set up which team member or company employee should receive e-mail notification about which order status change, with just a few clicks. Reset the module's initial settings any time, if you need to rearrange the company's staff and allocate different people to the respective jobs. This module has no known issues or incompatibilities with any theme or any other module and should work out of the box. Since this is a backoffice feature extension, the main benefit of this module, for the company's customers will be the better customer relationship management, if done correctly. If the same people take care of the same tasks in a relationship with your customer, that offers stability and increases customer trust and loyalty to your business and brand. Upon succesful installation, when the first configuration screen loads, create a shortcut to that config screen, by using the quicklink/create shortcut function of your admin dashboard's toolbar. From that quicklink it will be much easier to access the configuration screen later, if you need to make modifications to who gets what order status change notifications. After purchase, simply upload the module and click on install. The first configuration screen that will load automatically after installation, will also automatically show the confirmation message about the installation's steps. If any errors have been encountered during the installation, you will be notified about those, too. Vers.1.0.4 - Added the name of the status to the notification mails, so the employee receiving the notification will also see the new order status, bolded.